The Short- The LEGO Movie is one of the most enjoyable films I have seen in the last 10 years. For children or adults alike Lego is a top notch effort that takes its beautiful CGI and sprinkles it on top of a delicious and nostalgic sundae of winks and nods to the Lego products that we grew up with. Not only that but if you listen closely, Lego packs one of the most ingenious voice casts in movie history along with an end twist that might be the most meta thing to ever happen on film. The LEGO Movie was made for children of all ages, and for the adults who remember the first time they built anything with a Lego product at any age. 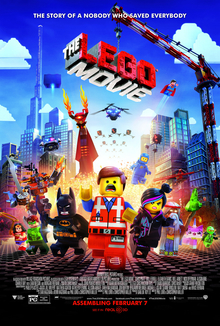 The LEGO Movie follows Emmett (wonderfully voiced by Chris Pratt) who is a normal everyday guy who stumbles upon a missing artifact that has him mistaken for a “MasterBuilder”. He is set on a quest to stop President Business (Will Ferrell) from using his mysterious “Krakle” device on the general public. Pratt is one of the many reasons why Lego stands out, between his charms as Emmett, Will Arnett’s hilarious Batman, and epic voice work from Morgan Freeman, The Lego Movie tops expectations. The LEGO Movie has a little bit of everything; it’s a kid’s movie that acts as a social commentary, taking plenty of jabs at our commercialist tendencies. It packs enough kid friendly material to keep any child entertained but its comedy is just as much aimed at the adults who accompany them to the theater. By the time we make it to the film’s final act, directors Phil Lord and Christopher Miller reveal the bigger purpose of The LEGO Movie (which winds up being some of its most deliriously enjoyable moments). The film carries one of the great voice casts in animated film history, a group that includes Elizabeth Banks, Will Ferrell, Alison Brie, Charlie Day, Jonah Hill, Cobie Smulders, Jake Johnson, Shaquille O’Neal, Nick Offerman, Channing Tatum, Liam Neeson, Will Forte, among others. It is a beautifully animated masterpiece of CGI special effects and hilarious Lego humor which helps carry an incredibly witty and sassy script. I never thought any movie could give me the same sensations that were so passionately delivered by Pixar’s Toy Story 3. Much like Toy Story 3, The LEGO Movie is the kind of experience that gives audiences a strong feeling of both nostalgia and pure unadulterated joy. The LEGO Movie will have you asking once the credits roll, “Was that really one of the greatest animated films ever made?” and my conclusion is it may not be the greatest but it’s damn near close. Starring- Chris Pratt, Elizabeth Banks, Morgan Freeman, Will Ferrell, Will Arnett, Liam Neeson, Charlie Day, Jake Johnson, Alison Brie, and Nick Offerman.